A disquisition on Khazar Jews, the real Israel and the situation in Palestine. And a message to the Ashkenazim, who are properly known in prophecy as Gog: Thus saith the Lord God; In that day when my people of Israel dwelleth safely, shalt thou not know it? This is a work in progress. Reference will be made to the late Arthur Koestler's book, The Thirteenth Tribe, which is at your fingertips to read at http://198.62.75.1/www2/koestler/. Also highly recommended is the Encyclopædia Britannica's entry on Khazars reproduced at http://www.show-the-house.com/id80.html. This classic article is from the 11th edition of the Encylopedia Britannica, which was published in 1911 when Arthur Koestler was only 6 years old; no doubt it served as his initial guide decades later when he wrote The Thirteenth Tribe. For additional reading see http://www.khazaria.com/. Also highly recommended is Imran N. Hosein's An Islamic View of Gog and Magog in the Modern World at http://imranhosein.org/media/books/ivgmmw.pdf. Bear in mind that the prophet Muhammad lived from about 530 to 632 and therefore never heard of the Khazar conversion to Judaism, which did not take place until around 740. On those who call themselves Jews, but are not. A disquisition on Khazar Jews, the real Israel and the situation in Palestine in 2009. And a message to the Ashkenazim, who are properly known in prophecy as Gog: Thus saith the Lord God; In that day when my people of Israel dwelleth safely, shalt thou not know it? The vast majority of people who call themselves Jews today are Ashkenazi Jews. Unlike the Sephardim, who are Jews descended by blood through Abraham, the Ashkenazim are actually a Turkic people descended from Khazars who had converted to Judaism in the Middle Ages, prior to their westward migrations centuries later into eastern and central Europe and eventually on to Palestine. This, in a nutshell, is the main theme of Arthur Koestler's book The Thirteenth Tribe. Though Koestler denies it explicitly (page 223), the Turkic roots of the Ashkenazim undermine their claims of entitlement in the Holy Land according to scriptures in the Holy Bible. And so the very idea that most modern day "Israelis" are not even of the blood of Abraham is considered a national security threat to the Zionist state because their pretensions of being racial heirs of the Almighty's promises and blessings to Abraham have been annihilated by an extensive historical record. So too, the term "anti-semitism" is rendered void of meaning and useless, at least insofar as it is employed by the Turkic Ashkenazi Zionists as propaganda. Ironically, their Palestinian Arab victims are real Semites along with the Sephardic Jews, Arabs in general and a few other groups, all of the blood of Abraham. At best, the Turkic Khazar-derived Ashkenazim are very long lost cousins of the Semitic folk, and have limited commonality with them in their genes along with the common house-fly and a host of other creatures of the Almighty's vast creation. But the Turkic Ashkenazim have legs up on the animal and insect worlds insofar that they share with the Semitic Sephardim and Arabs a common ancestor in Noah and therefore a common gene-pool. However, they are entirely different limbs of Noah's family tree! Koestler, being an established writer in post World War II Europe, and an Ashkenazi Hungarian Jew as well (just like the former [as of 15 May 2012] President of France, Nicolas Sarkozy), was hard to ignore or suppress. Indeed, one of his many sources is A. N. Poliak, whose book in Hebrew, Khazaria, published in Tel Aviv in 1944, advances this very idea that the dominant Ashkenazi Jews in what was soon to become the modern state of "Israel" are not quite who they say they are! But in the end, these details were simply overlooked, and more than sixty years after the founding of the Zionist state, one ponders the enormity of its full spectrum fraud and force. Setting aside for a moment these important issues of religious and ethnic identities, I point to White House Counsel Clark Clifford's frank admission in his memoirs Counsel to the President (Chapter One, "Showdown in the Oval Office," pages 3 - 25) that he and President Truman were opposed vociferously by Secretary of State George Marshall and every other top adviser when they chose to recognize the newly declared "State of Israel"; very good, rational advice was simply ignored for the sake of domestic politics! Koestler relies on modern sources including, inter alios, Poliak and Dunlop and Toynbee, as well as ancient Arab, Byzantine, Russian and Hebrew sources (page 206), which are corroborated by evidence emanating from Persia, Syria, Armenia, Georgia and Turkey. When he refers to Turkic peoples, he means a wide ranging grouping of central and southwestern Asian peoples, including the Turkish and Khazars and many others who had originally moved from east to west across the steppes of central Asia. Koestler's cosmopolitan and worldly wise ways make for interesting and entertaining reading, sometimes with witty and original commentary added to the narrative. This is one of those books I've read more than once. I bought my first copy at a used book sale at the nearby 92nd Street Y on Lexington Avenue here in Manhattan in the late 1980s, and twenty years later you can find several links to The Thirteenth Tribe on the Internet including this one: http://198.62.75.1/www2/koestler. As Koestler tells us, the earliest indications show an association between the Khazars and the Huns under Atilla. The Khazars proved to be more sedentary as the Hun whirlwind left them around 500 A. D. in a triangle between the Black and Caspian seas, hemmed in by the Don and Volga rivers and the waterway connecting them. After an initial tutelage under the Turkish, the Khazars coalesced into what the Persians and the Arabs called the "Kingdom of the North," whose invasions they would repel at the pass of Dariel (Kasbek pass) in the Caucasus Mountains and the defile of Darband near the western shores of the Khazar (Caspian) Sea. By 740 A. D., Judaism became the state religion of the Khazars (page 15) if only as a show of independence from the competing religious and political pressures emanating from the Baghdad Caliphate to the south and Christian Byzantium to the west. To the north and east of Khazaria were wild and fearsome pagans who simply lacked any of the attractive cultural traits that attached to the emerging adherents of monotheism. 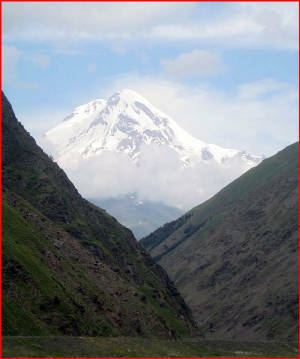 Photo at right shows Kasbek Mount through the pass of Dariel, or pass of Kasbek. Here in the Caucasus the Khazars met resistance in their expansion south against Byzantium, Persia and the Baghdad Caliphate. Known then as the "Kingdom of the North," the Khazars are today's Ashkenazi Jewry, or Gog. Joseph, King of Khazaria, frankly admits in correspondence with real Sephardic Jews in Spain that he and his people are descendants of Japheth and therefore not of the blood of Abraham, who descended from Japheth's brother Shem, the father of all Semites. However, the descendants of Japheth and Shem have in common strong genetic traits from Noah even though they evolved separately and differently. Until its breakup in the late twelfth and early thirteenth centuries, the Khazar Empire imposed its order on the peoples of the region, established a vibrant economy and clearinghouse for trade along caravan routes, and fended off attacks, particularly from the Russians and Vikings to the north, whose seafaring skills were first honed along the waterways of the Volga, Don, Dniester and Dnieper. In the latter capacity, the Khazars were often the valued allies of Byzantium and Baghdad when they were not fighting among themselves. The Franks and Khazars, unbeknownst to each other at the time, had almost simultaneously beaten back an advancing Muslim pincer movement on the western and eastern flanks of Europe. The population of Khazaria, particularly its vaunted standing army (page 51), was an ethnic mosaic including Jews, Muslims, Christians and many other Turkic tribes. The tallest structure in the capital city, Itil, which is present day Astrakhan, was a minaret. The landscape featured distinctive circular houses as well as vast farmlands and vineyards in the countryside. Caucasian viticulture is a lasting legacy of the Khazars. A truly cosmopolitan people, the Khazars were perhaps the first town and country folk, with the general population summering on their farms and wintering in Itil, located in the delta where the Volga flows into the Caspian Sea. After the breakup of Khazaria, the Khazar Jews migrated west into eastern and central Europe, where they formed shtetels (small towns or villages) mainly in Poland and Lithuania as well as ghettos within the cities and towns of the Ukraine, Belarus, Russia, Poland, Lithuania and Hungary. The popular Broadway play, Fiddler on the Roof, romanticized the lives of these Khazar Jews in popular American culture. Though the Khazars did not dominate as they once did in Khazaria, many of these Jews attached themselves to the royal houses of Europe and became effective administrators in both foreign and domestic affairs. Then came the world wars during and after which the Khazar Jewish populations of central and eastern Europe were significantly reduced with many pouring into Palestine among other destinations. "Holocaust" is a Greek word meaning "burnt whole" and connoting a sacrifice to Zeus or another Greek mythological deity; use of this term for purposes of Zionist propaganda is therefore blasphemous to the jealous God of Israel. It was in the post World War II milieu that Koestler became curious about his Khazar Jewish heritage, researched it, then wrote about it. In assessing The Thirteenth Tribe, it is of course necessary to weigh and consider Koestler's own beliefs and how they influenced his narrative. I am not an expert on Koestler, and never met him, so I can only go by what he has written in this particular book. I will endeavor to show that as much as Koestler does succeed in enlightening us about the Khazars by drawing together a diverse historical record, he omits -- at least against my own expectation -- one important consideration that brings all these matters of great moment to their proper conclusion. Whether this was done by design or by lack of attention, I cannot say. But I do feel that Koestler was purposefully leading us to a door which he himself, for whatever reason, dared not to open. He has left that for us to do. Koestler's reference to "the mythological covenant of Abraham with God" (page 223) is quite remarkable for a Hungarian Khazar-derived Zionist Jew to make and therefore deserves careful attention. For it was the Almighty's covenant with Abraham and not vice versa. And whether the covenant was mythological or not is, of course, controversial. There is certainly no doubt about this in a true believer's mind, for the justification of the Zionist state's existence rests on this belief. Here I can only offer my opinion: most Zionists share Koestler's clearly secular point of view, but will take the land anyway, both because of and despite any religious pretensions, real or imagined. And the main thrust of The Thirteenth Tribe, of course, shreds these pretensions. And so we are left with a bipolar condition constantly impinging on reality but never connecting with it in any meaningful way. Perhaps this is why Koestler led us to a door of great discovery, as I am about to show, but could not bring himself to open or even knock on it. Koestler makes a far, far graver error when he refers to the "exclusively Jewish name of Israel." (page 134) Indeed, this is the error of the ages, the mother of many other errors, and not just Koestler's. The plain truth is that the word "Jew" originally applied to only three of the twelve tribes of Israel; namely Judah, Benjamin and Levi. These three tribes banded together to form the Kingdom of Judah after the other ten tribes (Joseph counted for two: Ephraim and Manasseh) broke away to form the Kingdom of Israel not long after the reign of Solomon. The word "Jew" first appears in the Holy Bible in a context that clearly shows the Jews to be at war against Israel! (see II Kings 16: 5-6) This scriptural knowledge is of enormous importance for it is the key to interpretation of prophecy, especially prophecies about the return of the House of Israel and the House of Judah to the Holy Land. Though Herbert W. Armstrong succeeded in spreading this most important knowledge to the four corners of the earth for the better part of the twentieth century, few paid close enough attention. And so a fatefully fatally flawed statecraft of power politics introduced an Ersatz Israel into Palestine in a vain attempt to dominate the "Grand Chessboard"! As we shall soon see, even this Ersatz Israel was also prophesied long, long ago. Simply put, Zionism should not be confused with the "ingathering," or the prophesied returns of the House of Judah and the House of Israel to the Holy Land. And if the problems of Jewish identity and the key of prophecy are not enough for Koestler, the ways of a king seem beyond his spiritual awareness too. This European Khazar Jew expounds on what he considers a rather distinctive arrangement of two Khazar kings: the Great Kagan and the Kagan Bek (page 44), which correspond to the sovereign and his executive. He likens this "double kingship" with the Japanese Shogun and Mikado (page 55) and even the dual kingship of his native Hungary (page 142), but seems entirely unaware that his own Hebrew scriptures contain precursors to exactly the same regal regime: Pharaoh and Joseph (see Genesis 41:40); Moses and Aaron (see Exodus 4:16); and also King Ahasuerus and Haman, then Mordecai after Haman (see Esther 10:3). Nor does Koestler express awareness of the positive command in the Torah to choose a king (see Deuteronomy 17:14-20). So too are the Zionists in Palestine entirely lacking a king, let alone a dual kingship derived from the wisdom of the ancient Egyptians and Persians. Even the Iranians of today are in accord with this ancient formula of a Supreme Leader and President. You will know the real Israel by its King. After more than sixty years in Eretz Israel, this Ersatz Israel of the Khazar dominated Zionist state is a real ringer! A very bloody ringer! On the other hand, Koestler does indeed display key knowledge from the Holy Bible which bears directly on the subject matter at hand, the Khazars. For starters, he cites the genealogies in Genesis 10:2, where Magog is shown to descend from Japheth, son of Noah and brother of Shem. To this fundamental fact he adds several references (pages 20, 46, 72f & 81) to ancient traditions identifying Khazars with Gog and Magog. Perhaps the clearest prophecy of Gog supplanting the real Israel is in Genesis 9:29, "God shall enlarge Japheth, and he shall dwell in the tents of Shem..."
But here is where Koestler balks, and does not knock on or open a door of great discovery. He avoids altogether the Almighty's prophecies uttered against Gog through the prophet Ezekiel. Indeed, in chapters 38 and 39 of the Book of the Prophet Ezekiel, clear expression is made of a remnant of one sixth of Gog surviving and then arriving on the mountains of Israel, which is exactly how the Ashkenazi Khazar-derived Jews made their grand entrance into Palestine before, during and after World War II. The prophecies against Gog are dire prophecies, and the impersonation of the Ashkenazi Jews as blood descended Jews of the House of Judah or even of other Israelites descended from the lost 10 tribes of the House of Israel is clearly the point of the Almighty's command to Ezekiel to say to Gog, "In that day when my people Israel dwelleth safely, shalt thou not know it?" (Ezekiel 38:14) Sixty years are more than enough to know this tree by its fruit! In chapters 37 and 40 of the Book of Ezekiel, at the beginning and end of the prophecies against Gog, are prophecies concerning the real Israel. In chapter 37, it is shown that the real Israel will be known by a sanctuary, a king and the Almighty's covenant of peace. Chapter 40 to the end describes the location and details of the sanctuary. (For more about the correct site of the real Israel's next physical temple, see Appendix A of An Eight Part Peace Proposal for Greater Jerusalem at http://www.show-the-house.com/id3.html.) Throughout Koestler's lifetime, and more than two decades after his death, the Zionist state has had no sanctuary, no king and no peace of any kind. All three blessings are withheld from the Zionists. They only understand force to back their fraud. Their boastful words, and their supporters who are as dumb as nails and as used as screws, are really all they have.